Share Easter Sunday lunch in The Hall with family and friends after the biggest Egg Hunt in Perth! The largest pub in Australia is putting on this Easter's Largest Egg Hunt. 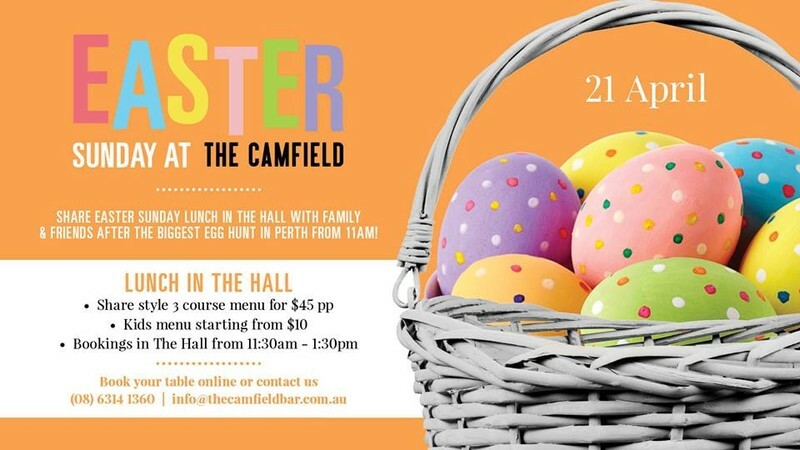 The Camfield will be hiding eggs around our entire venue! Be sure to arrive before they're all gone! Share style 3-course menu for $45 per person. Kids menu starting from $10. Bookings in the hall from 11:30am to 1:30pm. Book your table online or contact us.